Data is at the core of almost all digital transformation initiatives. Developers shouldn't have to wait for data copies to test and develop applications. Time-consuming and costly point solutions will only add overhead and complexity to your IT environment. Enterprise agility depends on empowering your developers with faster access to data, on-premises and in the cloud, for faster application test/dev that gives your business a competitive edge. Cohesity speeds IT delivery with a hyperconverged, software-defined solution that uses idle backups to power application test/dev environments. With Cohesity, enterprises can provide secondary data on-premises and in public clouds. Automated cloud backup and format conversion ease workload migration between data centers and clouds for maximum efficiency. Developers and IT alike prefer Cohesity's solution because it quickly makes data productive while drastically reducing overall storage footprints. Move away from the time-consuming, costly effort of making production data copies to automating application test/dev with secondary data. Ensure productive data is always available, on-demand to drive test-dev workloads. Instantly clone virtual machines (VMs) of live data as often as needed, without performance penalties. Transform idle backups on-premises and in the cloud into business-boosting advantage--all while reducing data center fragmentation. Enable self-service environments for your developers and application owners and see how your enterprise benefits from an instant test/dev environment. Never have to choose between cost and performance for test/dev. Both employees and the business benefit from semi-production storage performance at a fraction of the cost. Cohesity replaces the silos, overhead, and complexity associated with collecting and recreating production data for test/dev with one easy-to-manage, web-scale platform that's simple, unified, and cloud-ready. Keep development focused. Fix bugs faster. Speed the delivery of new products and services. Empower developers to clone the latest backup of their production applications with SpanFS and run it directly off the Cohesity DataPlatform. Get a virtual, fully-hydrated image instantly of every snapshot that is created, never sacrificing performance. Cloning operations used for rapidly spinning up Test/Dev environments are powered by Cohesity’s intelligent SnapTree data structures and snapshot capabilities. Facilitate rapid test/dev by giving developers and IT operations administrators full access to the exposed REST API. Enable automatic refreshing of test/dev environments on a scheduled or on-demand basis. Cohesity lets you use your backup data as more than an insurance policy against disaster. Eliminate expensive copies of data and make backup data residing anywhere more productive. Automate the conversion between on-premises and cloud formats. Easily move data for test/dev between on-premises and cloud. Gain web-scale enterprise-grade cloud backups. 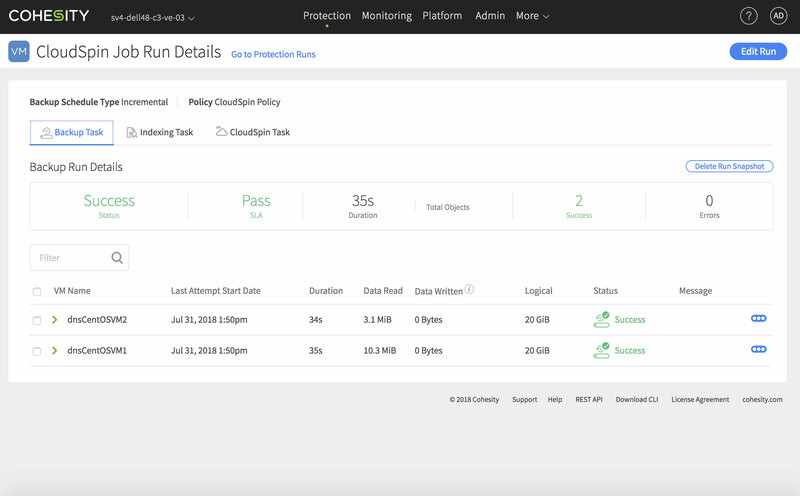 Learn more about Cohesity’s Cloud Integration. 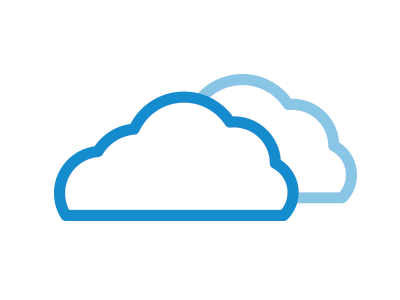 Test and develop with secondary data stored on-premises or in the cloud, you choose. Cohesity is flexible. Spin up new VMs in the cloud. Easily provision new applications and VMs in the cloud for test/dev using your backups. People are realizing they need to use data in better ways. If they're paying to store it and back it up, they need to know what they've got and how they can make better use of it. The combination of CloudSpin with native API integration in the cloud will enable us to elegantly accomplish our dual objectives of implementing test/dev and data protection in the cloud within a single offering. Looking to Make Your Secondary Data Productive for Application Test/Dev?